St Andrew's Barn01263 715779work01603 870304fax Self-cateringThis sunny, spacious and luxurious barn conversion in the heart of the popular destination of Burnham Market is set away from the madding crowds in a quiet spot, but is just moments away from everything that you will need to make this a most perfect place to stay. And with such easy access to all the nearby stunning North Norfolk coastal resorts, this one a real winner at any time of the year.. Rooms: 4 Bedrooms, 3 Bathroom, 1 Sitting room. 1 Kitchen/Dining room. 1 Utility. This sunny, spacious and luxurious barn conversion in the heart of the popular destination of Burnham Market is set away from the madding crowds in a quiet spot, but is just moments away from everything that you will need to make this a most perfect place to stay. 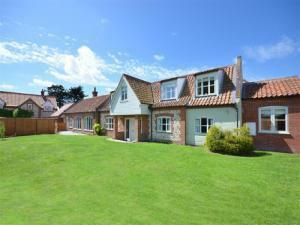 And with such easy access to all the nearby stunning North Norfolk coastal resorts, this one a real winner at any time of the year..